Phil McKinney is the chief technology officer for HP 's personal systems group. Jargon-free, he's head of the technology within the part of HP that makes PCs. Like most of the other presenters at this week's HP Labs event in Lisbon, he's about to give us the seven wonders of PowerPoint. But unlike most of the presenters, he's got genuine insight into what the future holds for personal computing. Joking that his remits still include calculators, McKinney seems relaxed and articulate - unlike your Tech.co.uk writer, who has a streaming cold despite the 27-degree heat outside of the bland, air conditioned hotel conference centre. McKinney gives us a 20-year view of the trends as deduced from the research carried out as part of HP's $3.6 billion yearly research and development budget. It seems like small change compared to the revenue from the Personal Systems Group - $30 billion. Giving the caveat that it is very hard to be very specific ("We don't look at trying to predict products. We predict trends.") he cited the impossibility 20 years ago of predicting the mobile phone and internet revolution. McKinney said his department's research and development was planned to hit those trend targets. "What are the user interfaces? What are some of the disadvantages?" he said, predicting that media experiences would 'converge' by 2010 - though he didn't suggest quite how. "Today we tend to have the media separate. Taking the media that you have and giving you an experience out in the real world. The physical and the virtual worlds will blur." McKinney related this to Mediascapes where virtual happenings depend on the physical position of the user. The assembled press were shown a video in which a teen was using an iPAQ to play a game in a virtually-recreated version of the street me was walking down. Mediascape is a software toolset that enables people to integrate the physical and virtual worlds. And, what's more, HP has already made the software available as a beta. To demonstrate the technology, we were shown a real Mediascape down the road in a Lisbon park. Using GPS for positioning, we were able to walk round listening to location-specific audio when triggered by our own position. HP Labs reckons that virtual environments will be highly usable by 2020, with virtual collaboration replacing the conference call by 2015. As a side issue, McKinney raised the question of legality in virtual environments. "There are a lot of challenges even in the world of virtual collaboration [let alone] communities," he suggested. HP seems to believe in the smart TV concept that, he says, will be commonplace with fully intelligent flat panel displays available from manufacturers like Sony . Unfortunately though, his main sell on this one is that a TV is DRM aware - not exactly a consumer benefit per se. Unfortunately, McKinney didn't suggest how HP would help solve the biggest problem facing technology. But at least he knew what it was." The challenge is how we make sure how all these devices work together...how do they interact and be self-aware?" He did, however, talk about the digital home in another form. He thinks seamless interaction between devices will be in place by 2015, when the 'smart house' will be a reality. With a small caveat. "We do think it will take a significant amount of time before it is ubiquitous"
Interestingly, HP Labs believes that by the time this happens, we won't be restricted by the storage capacity or even the ability of individual devices, a concept McKinney calls 'content at will'. 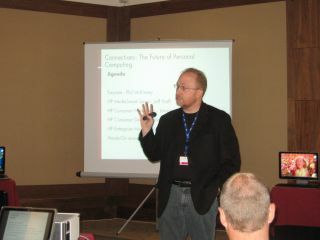 McKinney thinks this will be aided by the ability to be always connected to networks by 2010.